The former world champion and Trump, the reigining UK Champion locked horns in a high quality semi final that saw Robertson shoot into a 2-0 lead with a break of 100 after clinching the opening frame. Trump though, who had displayed fine snooker in ousting Ronnie O;Sullivan soon responded with a break of 76 to reduce his deficit to 2-1 before Robertson re-established his two frame buffer with the help of an 89. The Australian hammered home his advantage after the interval as he claimed the fifth and sixth frames to leave himself only one frame from victory. Judd needed everything if he was going to stay in contention. Too his credit the Bristolian fought his way back to 5-3 with the help of a 95 in eighth frame before Robertson finally snuffed out his revival with a 69 to clinch a place in the final. Murphy, enjoyed a flying start as he rattled off the the first two frames with breaks of 86 and 101. It amounted to 205 unaswered points, and the second frame break gave Murphy his 222nd century of his professional career. Higgins though looked favourite to take the third frame when he fired in along red from the baulkline and made 62, on ly to miss a red to the green pocket. To make matters worse the red sat hanging over the lip of the pocket. The world champion was made to pay for his mistake as Murphy rolled in a 69 to steal the frame on the black. 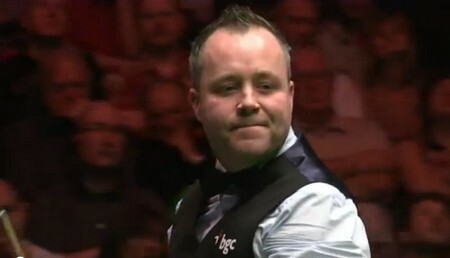 Higgins badly needed the fourth frame if he was to gain some sort of foothold in the match and captured it with a 49 to go to the interval 3-1 down. Murphy's response on the resumption was emphatic, a 122 to move 4-2 in front. 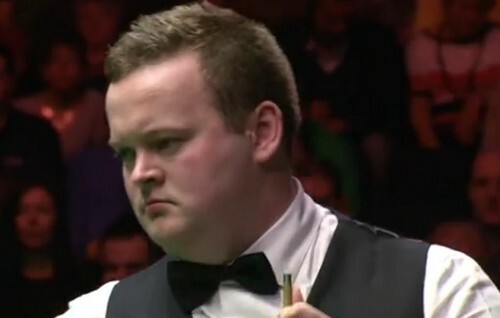 But Higgins once again closed to only one frame behind with a 59 to leave the scores poised at 4-3. The Scotsman looked well set to build a sizeable break in frame eight only to miss a black off its spot. That was bad enough, but cue ball ended up splitting the pack of reds. In prime position Murphy confidently rolled in a 100 clearance to leave himself one frame from victory at 5-3. But Higgins was in no mood to surrender. He won a safety duel at the beginning of the nonth frame and left in prime position made no mistake in making a 72 to reduce his deficit to one frame at 4-5. Murphy, one up with two to play, but Higgins cueing well. One thing that had been missing from this tournament was deciding frame. Were we to get one here? The answer was to be no as Higgins overcut a pink to a"blind" corner pocket and left Murphy with an easy starter. Dropping the red in Murphy knocked in a 55 to put himelf close to victory. With five reds left on the table Murphy took a chance on a long red to the corner. He missed and scattered the reds and left John with a chance of a counter attack. With the excitement in the arena was mounting as Higgins proceeded to 48 and left himself with a long pink to the yellow pocket. Higgins struck the pink well enough but was to see it rattle in the jaw and shoot across to the greeen pocket and stay out. 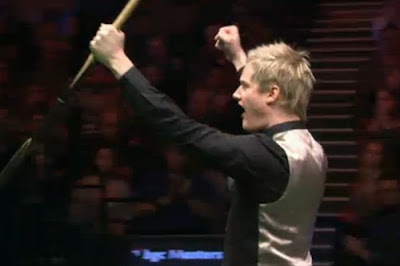 Murphy strode to the table and tapped in the pink and accepted a warm handshake from the world champion as he claimed a 6-4 victory and with a final showdown with Neil Robertson.